So you are a new DJ on CCC Radio -- super! To make your show happen and be a good Radio-Citizen, you need to know a few things about how the station works and how to keep your show sounding great. Cedar Crest College radio broadcasts to the world via Spacial Audio's SAM Broadcaster platform. This means that anyone, anywhere can listen over the Internet at any time. Anyone who navigates to http://radio.cedarcrest.edu will be directed to the station on any device (computer, phone, tablet, etc). The SAM platform allows CCC Radio to designate DJs, create a broadcast schedule, have remote broadcasts and so much more. For the purposes of this article, we will be discussing how you would change the source of the broadcast to do your show when you are ready. Check the laptop, make sure that "ME (cccradio@cedarcrest.edu) is showing green (as in the screenshot below). When you are ready (music source plugged in, butterflies out of your stomach), lower the volume on the music and raise the volume on your microphone or music. Most of the time when you come in to the studio to do your show, everything will be functioning as it is supposed to. In the case that your pre-check has failed any of the checklist items above, here's how you can fix it. This image represents what you should see when you come in the studio on the laptop. The top left arrow points to the "ON AIR" green indicator, this should be on "ME (cccradio@cedarcrest.edu)" as in the image. This is the local studio source. The arrow to the right of that reference the broadcast source controls for the local studio. - Disconnect will drop the studio broadcast (don't do this). - Switch Now (if available) would force the source to this source. - Switch on Track Change would change to this source after the other source completes the current song/show. The Orange "Started" shows that the SAM Broadcaster Cloud is ready to go when you need it. - Stop would make it unavailable (don't do this). - Switch Now would change to the SAM Cloud from the the local studio. - Switch on Track Change would change from the local studio to the SAM Cloud after the track change/show. This does not work in our current setup, don't use this. The Voice FX control dialog (just below Broadcast Control) shows the Mic is On (green indicator), the MIC IS LIVE and the the Lock Talk button is locked. You should never have to touch any of these controls, unless they are not green. If they are not green, they need to be clicked to make them green. Problem: No one can hear me, they only hear music. Solution: Check the Broadcast Control Source, is it on "ME (cccradio.." -- if not, click Disconnect on SAM Broadcaster Cloud and then Switch Now on ME (cccradio...). Problem: I did that, they still hear music - or - that looks fine. Solution: Make sure you have adjusted the volume on the sound board to reduce the volume coming from the computer, and raised the volume on your microphone or music source. Problem: The laptop screen is locked and says "Press CTRL-ALT-Del to login"
Solution: Press CTRL-Alt-Del to login, username is cccradio. Contact the Station Manager for the password. Once logged in, run through the check as above. Problem: The laptop is just showing the desktop but nothing else is happening, and the station is not broadcasting from the studio. 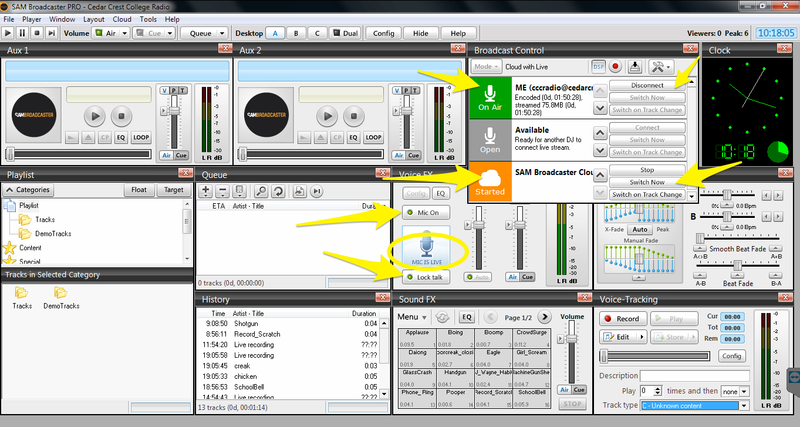 Solution: Double click on the SAM Broadcaster icon on the desktop, it should load and take control of the broadcast. If it does not, follow the instructions under "Broadcast Source Control" to bring the station back online. Problem: The online station does not show the names of the songs I am playing. Solution: This is based on the source. Playing songs through the sound board does not allow for song names to be displayed on the station web page.